This entry was posted in birds, Illustration on January 1, 2014 by Jane Porter. Today is publication day for ‘Twit’, written by Steve Cole and illustrated by me. It’s an early reader from Orion, and is a very funny story about three over-confident, bossy owls and their rather gullible little brother. A lovely way for beginner readers to build up their confidence. Stop press: Those nice people at Orion have just launched a competition to Knit Twit – craft your own little blue owl, and send in a pic for a chance of winning a prize…all the details are here. Get busy as the closing date is the end of October! This entry was posted in birds, Books, General news, Illustration on October 2, 2013 by Jane Porter. I’ve had great fun working with Ladybird Books on a brand new series called First Fabulous Facts – as the name suggests, it’s non-fiction for very young readers. The first two titles, Dinosaurs and Minibeasts are out now, with two more to follow soon and another pair next year. I’ve done the cartoons, and another illustrator, Patrizia Doneara, has done the more scientific drawings. I really like the way they’ve designed the series – an appealing way to learn about the world. 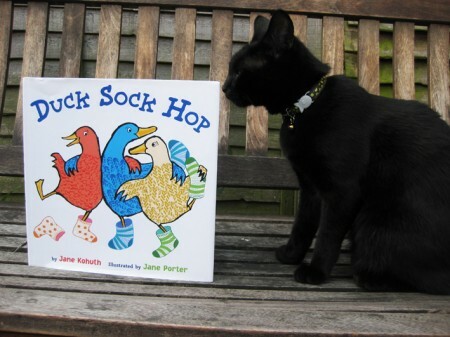 This entry was posted in animals, birds, Books, Illustration on September 9, 2013 by Jane Porter. All my life I have lived near the river Thames, and it’s a mighty body of water that I feel a very strong emotional connection to. As a child I used to love visiting the river at high tide and letting it go over the top of my wellies, and I still feel a thrill when I see the water lapping over the towpath. In the last couple of years I have taken up skiffing and punting, so I am spending more time than ever on the water, enjoying seeing the river and its wildlife up close in all seasons. I’m also very involved in one of the tributaries, the Wandle, through local environmental organisation The Wandle Trust which organises monthly river clean-ups. I’ve now been given a wonderful opportunity to create an exhibition for The Art Cabin, and I think the Thames is going to be my subject. 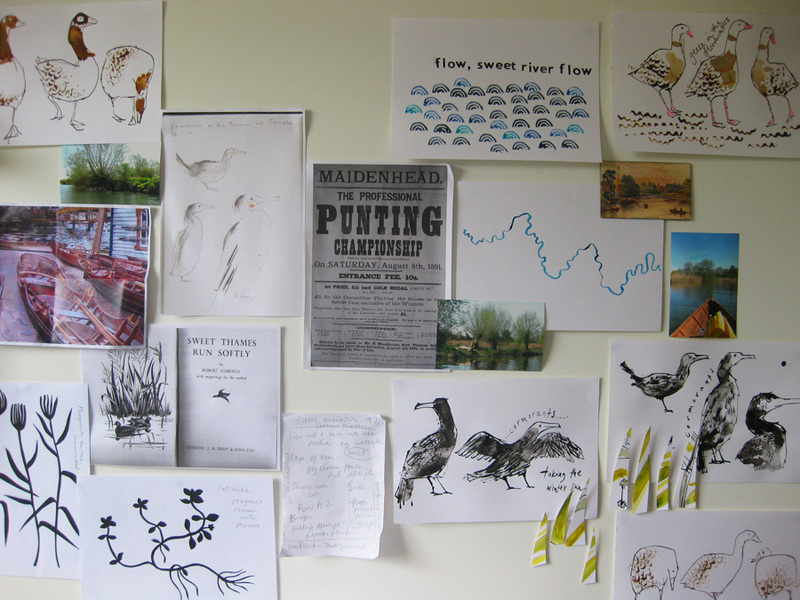 I’ve started a bit of drawing and collaging, observing herons, grebes, grey wagtails and my favourites, the cormorants. I’ve also been delving into one of my most treasured books, Sweet Thames Run Softly, by Robert Gibbings. (there is a marvellous British Pathe film clip of Gibbings walking by the river here). Gibbings was a writer and woodcut artist who built his own small boat on the eve of the second world war, and paddled the whole of the river, from Lechlade back to London. The book is a beautifully illustrated account of the journey. Back in May I did the same journey over four days by skiff, and have been sketching out some ideas for linocuts inspired by my own trip. It’s very exciting to be at this stage of a project – it could go in any direction, any media and at the moment there are no constraints. I’ll post more news on the project soon. This entry was posted in birds, Exhibitions, General news, Illustration, River projects on July 29, 2013 by Jane Porter. Here’s a sneak preview of some work I have been doing for Orion’s Early Reader series – it’s a lovely story by Steve Cole about an owl family. 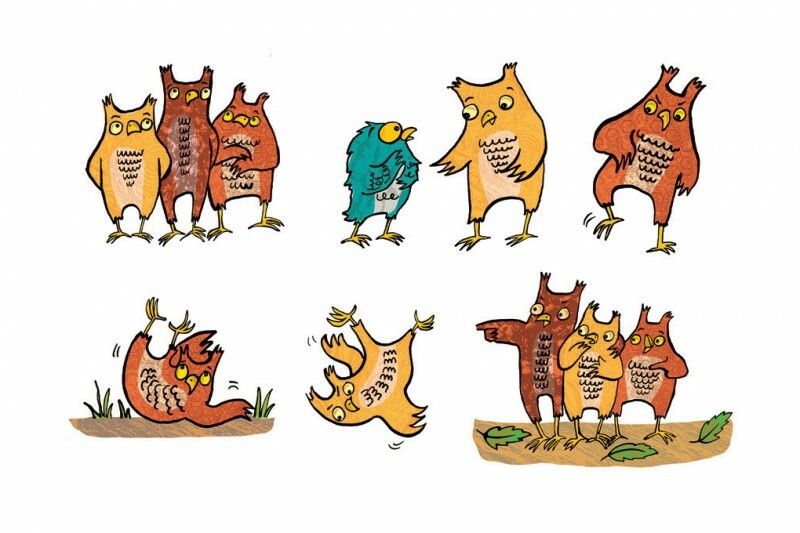 These three bossy owl brothers were my favourite characters to draw. The book is due out later in the year – I’ll post more details nearer the time. This entry was posted in birds, General news, Illustration on April 18, 2013 by Jane Porter. This entry was posted in birds, Illustration on January 1, 2013 by Jane Porter. 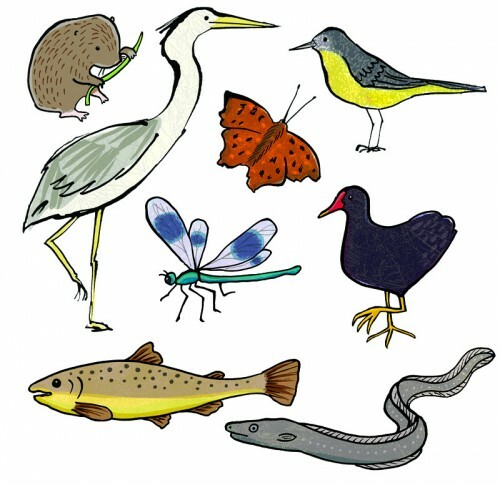 Here’s some wildlife from the river Wandle – illustrations I’ve been working on for the Wandle Trust‘s forthcoming vision statement document. This entry was posted in animals, birds, Illustration on October 10, 2012 by Jane Porter. 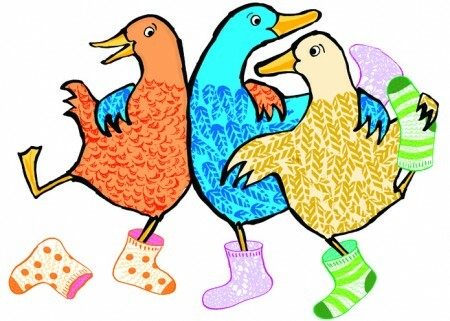 It’s finally here – Duck Sock Hop is officially published today, by Dial Books, a division of Penguin US. 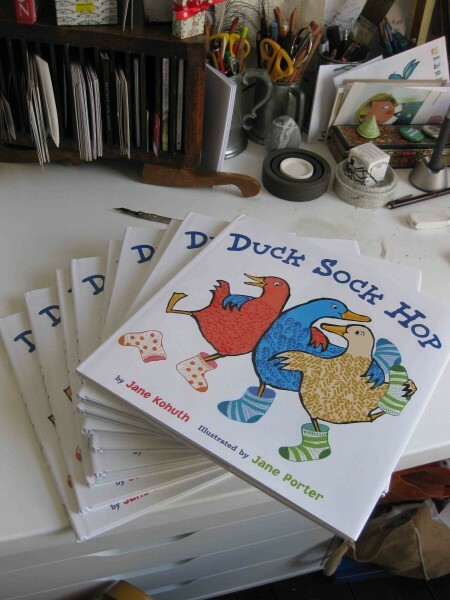 It’s been an amazing process to be involved in, from first seeing Jane Kohuth‘s brilliant text about 18 months ago, through researching ducks at the London Wetland Centre, drawing and revising pencil roughs, completing the artwork and finally holding the finished book in my hands. 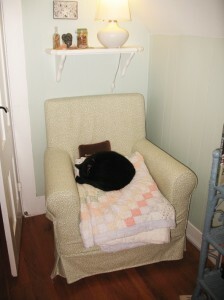 One of the nicest parts has been getting to know author Jane Kohuth – it turns out we both have identical black cats…here’s mine, and you’ll seen Jane’s later. To celebrate the book’s publication, I interviewed Jane about her career as a writer – and she interviewed me about being an illustrator! Here’s what Jane said to me – and you can visit Jane’s blog here to find out what I said to her. It’s also worth checking out other interviews at 7 Impossible Things Before Breakfast and Amintha Knight‘s blog. Both of us Janes are also featured discussing the working process and our influences on Literary Friendships. I wanted to become a writer because books were magical for me. They gave me more pleasure and stimulated my intellect and heart more than anything else I experienced as a child. I wanted to be one of the wondrous people who created these things. 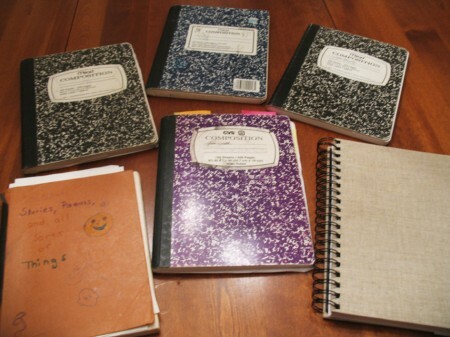 I already knew I wanted to be a writer early on in elementary school — really as soon as I learned to write. By the time I was in third grade, I had already formed a writing club with my friends and it was an accepted fact that Jane should write children’s books when she grew up. I set that aside for a while in my teens and early twenties, but I came back to it, because it had always been the right thing for me. Who were your favourite writers and illustrators as a child? And who are your favourites now? I’m doing picture books only, here, as otherwise this would get far too long. As a child: Russell and Lillian Hoban for the Frances books. Frances was me! Arnold and Anita Lobel, James Marshall, Harry Allard, Steven Kellogg, Maurice Sendak, Cynthia Rylant, Ezra Jack Keats (he showed kids in the city, like me), Gene Zion, Audrey and Don Wood, Barbara Cooney, Virginia Lee Burton. I’m sure I’m leaving some out. Today: all of the above plus Joyce Sidman, Marla Frazee, Liz Garton Scanlon, Kevin Henkes, Sandra Boynton, Mo Willems, Laura Vaccaro Seeger, Erin and Philip Stead, Sarah Stewart, David Small, Mary Ann Hoberman, Tao Nyeu, and perhaps above all, Mem Fox. And I am sure there are more. Can you talk about the process of writing – how you develop an idea and refine it into a perfect picture book text? Any tips? Are there places you go, or routines you follow to get inspired? I try to always keep a writing notebook on me (nice small ones fit in my purse and in my bedside drawer) because ideas come to me as fleeting thoughts or little bursts when I hear words that sound good, hear someone tell a story that makes me think of something, see an image or object or landscape that gives me the hint of a story. I write down these inchoate ideas in lists, which I refer back to when I’m looking for a project to start working on in earnest. I definitely recommend always keeping some method of writing on you. I then write a rough draft, generally in one or two sittings. Sometimes these flow beautifully, and I find myself writing with great excitement and energy. Other times it’s harder to translate my idea to the story form and I struggle. Sometimes the ones I really struggle with get abandoned or put away for a long while in the hopes that when I come back, my brain will have figured out what to do. Sometimes this works — try it. Others I keep at. For all my manuscripts, the easy ones and the hard ones, I then revise, often transferring a handwritten text to the computer and editing in the process. I then submit this second draft (or I may do one more) to my writing group, who give astute and very helpful critiques. I highly recommend writing groups! I then revise more, perhaps submit again, and then send the manuscript to my agent for feedback. During the revision process I am trying to shape the story so that its arc is compelling, so that the characters stand out, and so that the language is beautiful to read aloud. I studied creative writing as an undergraduate, with a focus in poetry, and I subject all of my texts to the same scrutiny that I would a poem in terms of sound, rhythm, and flow, even though the subject matter might be quite different from the “grown-up” poems I once studied and wrote. I am bad at routines, but I do think that walks help me to clear my head and have the added bonus of giving me the opportunity to see and hear things that might inspire a new or in-progress story. Four years ago my husband and I moved west of Boston, to a real New England town. We live in a little 19th century house downtown. It has a tiny room under the eaves that I use as my office. But I also love taking advantage of beautiful days and working outside on my patio. I also sometimes work on my living room couch, in bed, and in cafes with other writer friends. On my perfect day I would experience one of those rare times when a story with beautiful language seems to just flow onto the page. Still feeling exhilarated about the potential of my work-in-progress, I would go on a nature walk or to a botanic garden with my husband. The sun would, of course, be shining, the temperature a perfect seventy degrees. Flowers would be blooming everywhere, and I’d get to see lots of wildlife. Then we’d have dinner at a real Jewish deli with my best friends, and after dinner my friends and I would have great conversation. Maybe on my second most perfect day I’d win a big award for one of my books. . . . The most rewarding part of my job is the feeling of concentration, excitement, and creativity I get when I’m deeply involved in a writing project, which is going well. Some moments feel almost out-of-body in the way the world drops away, and I am completely immersed in the work. The close second is the experience of holding my published books, turning the pages, feeling the textures, and imagining children engaging with the books the way I did as a child. I want my books to be gifts — a kind of pay-it-forward for what I received from children’s writers when I was growing up. And it’s been surreal to visit stores and schools and see children interested in my books, asking questions, clutching them, paging through them. I’m not at all used to it yet. And then I get wonderful second hand stories about children who have developed attachments to the books. I met with a boy with ADHD and learning disabilities and his mother, and his mother told me how much the boy related to Estie’s social struggles. I feel like my books now have their own lives of which I only get glimpses. It is a wonderful and wistful feeling at once. We asked our lovely editor, Nancy Conescu from Dial Books in New York, to answer a few questions about her perspectives – and here’s what she said. What qualities make you love a picture book manuscript when you receive it for consideration? What qualities do you look for in an illustrator’s work that makes you want to work with him or her? When I’m considering picture book manuscripts it’s the voice and read-aloud quality that I’m drawn to immediately. I look for stories that I think will inspire repeated readings and characters I think have breakout potential. (I’ll confess that I tend to favor well-intentioned but ill-behaved characters–the Pig Won’t’s of the world!) I also look for humor and consider the illustration potential a manuscript has. Oftentimes we’ll receive strong texts that seem more targeted to parents than to kids, and those are never for me. I like books with genuine kid-appeal. As for seeking out illustrators, I look for artists with unique styles, memorable characters, kid-appeal, and the ability to convey movement and expression. Do you ever have to turn down manuscripts you want? If so, why? I do sometimes have to turn down manuscripts that I wish I could pursue, and it’s always a little heartbreaking. It takes a whole team to publish a book successfully though, and if there’s not enough collective enthusiasm for a project, I feel I’d be doing the author a disservice if I took on his or her work. That doesn’t mean it’s not disappointing to me and to the author though. What drew you to Duck Sock Hop when you first saw the text? 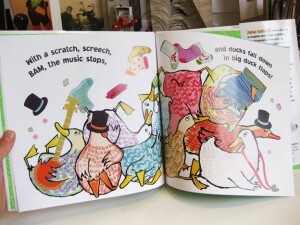 Duck Sock Hop is the kind of text you can’t possibly read without smiling. It’s very Sandra Boynton-esque in its read-aloud quality, and I felt that kids and parents would truly enjoy reading it and sharing it. I also imagined it with Jane Porter’s illustrations. 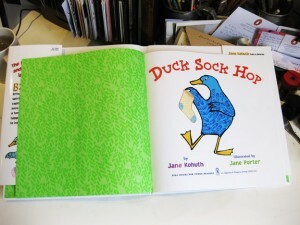 I felt that her bright colors and bold lines would be a perfect match for Jane Kohuth’s joyful text, and indeed it turned out to be a wonderful pairing. What kinds of books do you like to read for pleasure? What are some of your favourites? I always wish I had more time to read for pleasure, but a great deal of my reading time is devoted to submissions. I did just finish Jenny Lawson’s memoir Let’s Pretend this Never Happened, which I absolutely loved, and I’m in the midst of an adult non-fiction book right now. I sometimes find adult memoirs and non-fiction to be an interesting change of pace, but more often than not, my reading for pleasure is focused on middle-grade and YA. I recently read Wonder by R.J. Palacio, and I have Trent Stewart’s latest Mysterious Benedict book and Kelly Barnhill’s The Iron Hearted Giant on my to-read list along with lots and lots of other books I’ve stacked up at home and at work. I feel very lucky to have a job that I love so much and that gives me the opportunity to work with so many inspiring people. It’s incredibly gratifying to help authors and illustrators execute their vision, deliver their best work, and ultimately see the books that results from the process. I realize how much trust it requires authors and artists to put in me and in us, and I’m beyond grateful for their willingness to share their work. Hmmm….my perfect day? I’m not sure there’s just one kind. I love finding new manuscripts and new artists, but I also love the moment when an author delivers a revision or an artist delivers their sketches or final art. Then, of course, there’s the moment when finished books arrive, which never loses its magic. And, on a more basic level, it’s always really rewarding when an author or artist connects with the notes you’ve sent and is excited and inspired to revise. So, I guess it’s nice to have so many different things that can make my day. That’s not to say that every day is perfect—we work very hard—but I think that when you’re passionate about what you do, you’re able to appreciate a great deal of the process. 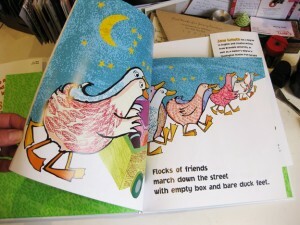 This entry was posted in birds, Books, General news, Illustration on May 10, 2012 by Jane Porter. 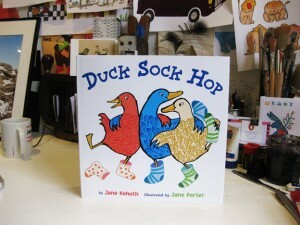 In the post from New York: a big box of copies of the book I have illustrated, Duck Sock Hop. It’s published next week, May 10th, and is available here. Soon I’ll be posting an interview with the author, Jane Kohuth, so watch this space! 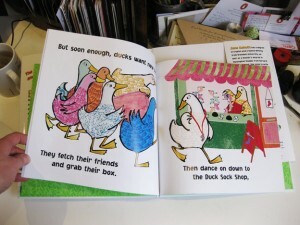 This entry was posted in birds, Books, General news, Illustration on May 2, 2012 by Jane Porter.